The City of Seattle has filed suit against the Trump administration over threats to withhold federal grant funds from so-called “sanctuary cities,” a move that came two days after Attorney General Jeff Sessions raised that possibility if cities refuse to enforce federal immigration laws. Murray insisted that, “We value civil rights,” an assertion that might draw criticism from Second Amendment advocates, considering the city’s anti-gun policies. Murray and City Attorney Pete Holmes stood in front of a group of supporters to announce the legal action, which had been initially reported by Crosscut. 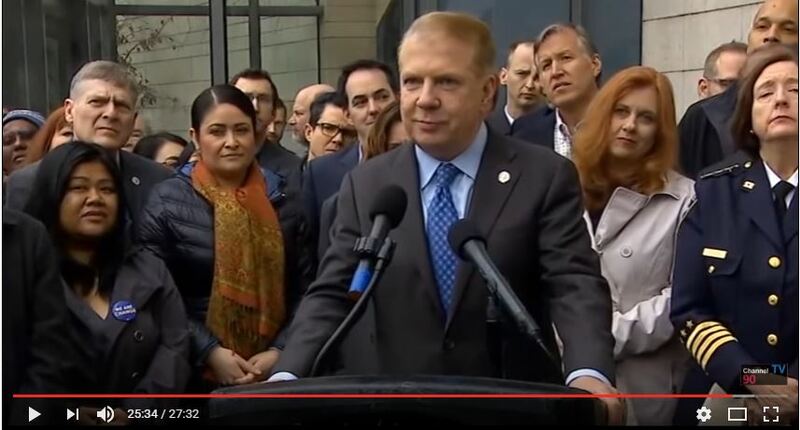 As soon as the press event began at city hall, the Seattle Times also reported the lawsuit. According to Murray and Holmes, the city is represented by the law firm Mayer Brown. Murray contended that, according to data, “crime rates drop in immigrant communities.” He asserted that the Trump administration has engendered fear among immigrants, and further insisted that the city is not breaking any laws by refusing to enforce federal immigration laws. He cited the Tenth Amendment in his defense of the city’s position. There is no small amount of irony in this, since it was that very argument in Printz v. U.S., the 1997 Supreme Court ruling that struck down parts of the Brady gun control law as unconstitutional. Murray noted that Seattle is among several cities that have been involved in discussions about how to respond to various actions of the new administration. Holmes accused the administration of “incessant saber rattling” and said this is what is making communities less safe. “We’re staying true to our values,” Murray told reporters Wednesday.